Here’s a nice colourful scene. It’s Cannes in the South of France. 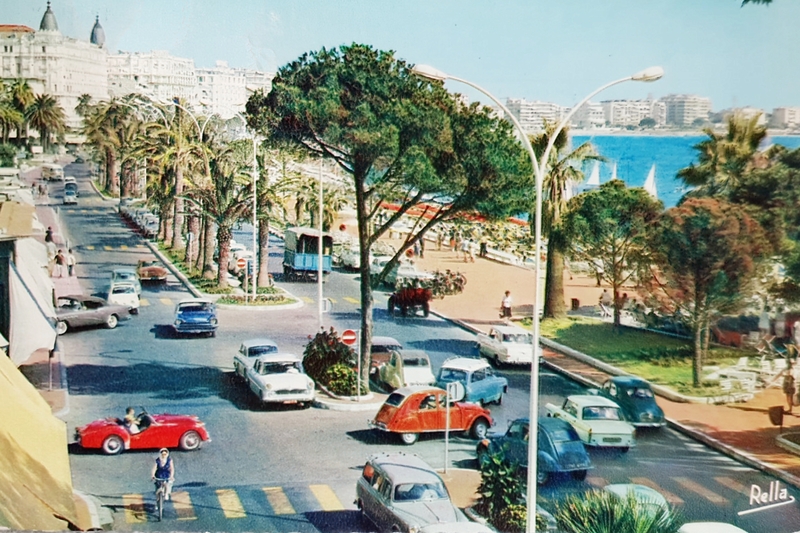 When I bought this postcard I did so for the bright red Triumph TR3 with its top down crossing Boulevard de la Croisette. When I examined it more closely I was pleasantly surprised to see the grey Buick Roadmaster or Custom (?) with its roof up (undoubtedly against the sun) pulling off the boulevard behind it. There’s also the blue car near it… looks American to me, though I can’t quite get it. Maybe a 57 Ford? The rest of the cars are what one would expect for the early sixties in France, but what is that blue car with the white roof and roof rack behind the red Deux Chevaux? I’m not sure I know what that is and the red car heading away from the camera on the right? What on earth is that? A vintage car? At first I thought it was a horse-drawn carriage but it has four wheels and no horse. Another mystery. The card was posted on the 23rd of April 1965 and has an ink stamp on the back that reads ’18th Cannes Film Festival’ though that did not begin until 12 May. The message is simply an address in Cannes and it was posted to 4 Champs Elyses (sic), Paris. We’ve had a postcard from Cannes before… see A Couple of Lovelies in Cannes . It also shows the Carlton Hotel and a lot of Dauphines (It’s surprising there aren’t more in this photo). If you like Renault Dauphines, see six more cards that capture this little beauty – Dauphines. I didn’t recognise that Simca but maybe it’s an Aronde Châtelain rather than a Aronde Messagère? More Lady of the Manor than errand girl? Interestingly the photo I found on the web (below) shows a car in the motor museum in Reims, which we visited last year and which I blogged about on my other blog Beam Breaking. See To Italy and Back – Day 14. Please send me a time machine… The blue American car is a 1957 Desoto (may be a Fireflite, like the well-known Dinky Toys one). The car with the white roof and roofrack is the estate version of the Simca Aronde, and called Messagère. In English that would be something like an errant-girl. And yes, that red thing-on-wheels heading away seems to be a vintage car! You’re quite right, Bob. After reading the blog I at once mentioned ‘Messagère’ because I recalled that name first and without a check… The Châtelaine had a rear seat and windows; the Messagère was the panel van, as you stated correctly. If you’re going to have a spin at the wheel of any of these (I would like to…), the car will offer you sufficient height to keep your hat on!